1. Lay out the shirt on a flat surface. 2. Fold in half matching seams. 4. Cut off sleeves (12" up). 5. Open up your shirt. 6. Take the sleeves you cut off and open up the seams. 7. Lay the opened sleeves on top of each other. 8. Trim the sides to make them straight. 9. At the bottom (where the sleeve is hemmed) measure 1". Cut into strips. 11. On your sewing machine adjust your stitch to its longest length. For you want to make a bunch of ruffles. You can go to ~Ruffles and Stuff~ for more information on how to make ruffles. 12. Place a strip of fabric in the middle of the sewing foot. Stitch. 14. Take one of the strips and lay it down the middle of the shirt, at the top. Pin. Now you may need to wrestle the little strip down before it stays. LOL. 16. Sew down the middle of the each strip to secure. If you have questions, please feel free to ask away! This is such a great tutorial! The shirts look great and I will definately be trying this sometime soon! I saw your link on Tea Rose. Great job and excellent instructions! Just a tip, if you take out a few stitches in the collar you can tuck the ruffles under and sew it back down giving it a finished edge on the top. 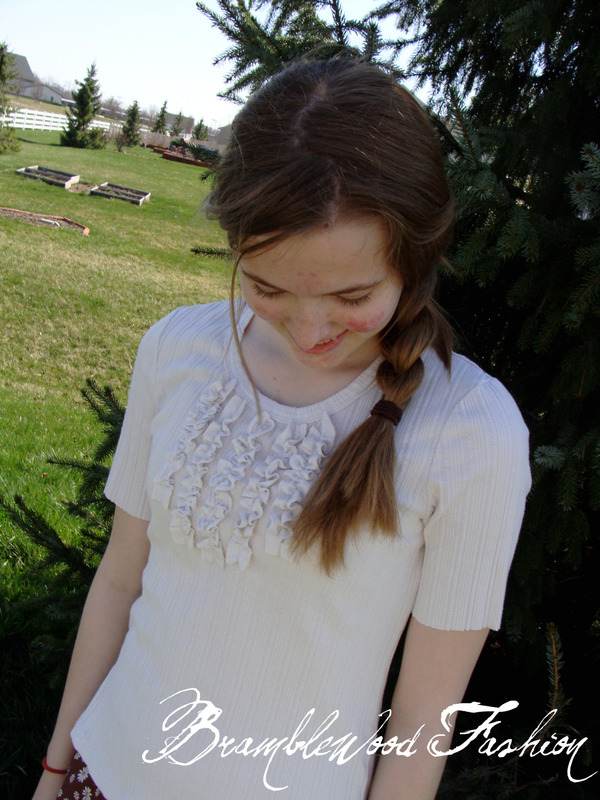 I made my first ruffle shirts using your tutorial! Thanks for posting it, they turned out great!